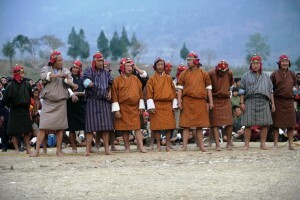 Bhutanese men preparing for a bout. Two men face off amid a small circle of spectators. The young women in the crowd are aflutter and boys wait anxiously for the fight to begin. Pitting the strength, agility and stamina of one young male against another, wrestling fulfills a primal urge across all cultures. Keshey, the Bhutanese version, is no different. The word literally translates to something as “To Hold the Waist”, a fitting description since the goal of the participant is to toss the opponent to the ground by grabbing hold of the kera, or belt. A vigorous heave combined with a strong hold and firm footwork are the requisite skills, combining the best elements of a top athlete. Brute force, concentration, mental and physical agility and a good sense of balance, the same qualities, in a way, that are revered across all cultures. Take, for example, ancient Greek art illustrating the Homeric epics. More often than not their best heroes were depicted in the lion stance of a wrestler, crouched low, muscles tensed, and the gaze intense. Not for me the effete, over-starched and overdressed athletes of golf, croquet or cricket who pass these days for sports heroes. Recently, my thoughts punctuated by the dull thunk, bounce and squeak of a basketball court (another modern upstart in the field of sports), I began to wonder about the men whose names, in the telling, brought a gleam to my grandmother’s eyes. The legendary brothers Pila Gonpo and Pala Gyaltshen who were accomplished wrestlers before they became master swordsmen. Leaders of men before they were athletes, the Pala-Pila brothers live on in oral tales immortalizing their storming of the Field of Weeping Willows, or Changlimithang, the site of our national stadium today. Similarly, Mikthoem of Punakha, another man who struck fear in the hearts of other men until he was finally quelled by the royal forbear Druk Desi Jigme Namgyel. Of more recent note were the soldiers Ap Gempo, Sangay Dorji and Kencho Tshewang, national champions all, back when Keshey was king. In the early 1930s Keshey most adult males attending annual religious festivals ended the day by indulging in vigorous rounds of Keshey. 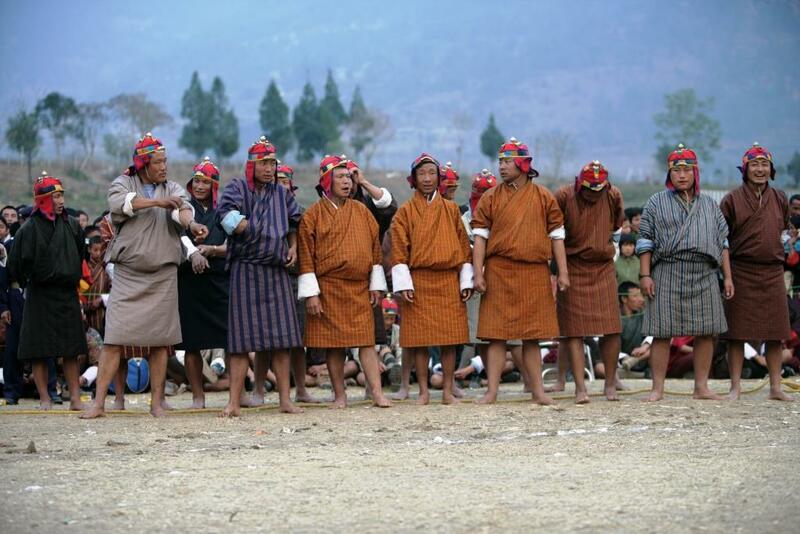 Especially in East Bhutan, at the Gom Kora Tshechu, local Keshey legends gathered from all the nearby villages and communities. Participants and spectators alike lived in tents for up to three days for the express purpose of enjoying impromptu wrestling matches. When the sun set in the western horizon and all the religious rituals of the day were done, all the champions, adventurers, challengers and upstarts gathered at a central location near the festival grounds. Circles formed and crowds parted and men grunted, perspired and strained within those excited mobs testing each other’s strength, endurance and resolve. The usual reward for the winners, according to Lopen Kuenzang, was a baetrum (old copper coin) for each bout. The loser’s face was usually stained with some ash by members from the winner’s camp, a customary gesture that was usually perpetrated and accepted with some lightheartedness in both camps. Elders say there was a time in Kurtoe valley when local villagers became so enamored with Keshey that they frequently did not even wait around for the annual festivals and simply held well-attended if unscheduled matches that quickly became the talk of the region, bringing more spectators and participants for the following rounds. In the evenings, flags would be raised outside the winner’s camps, local brews of chang and ara would flow freely and melodious laughter and songs rang across the valley. Contrast that with the lack of a single Keshey match on the annual calendar today and one begins to see the true magnitude of the task for such Keshey revivalists as Thimphu locals Tshering Phuntsho and Lhawang Norbu, who want to introduce the sport as part of daily school curriculum. If they succeed (and one certainly hopes they do) the valleys may fill once again with the mirth and songs of Keshey’s new heroes. If they fail, these oral remnants as I have uncovered from my elders may be all we have. And even that is likely to disappear all too soon like footprints in the sand.